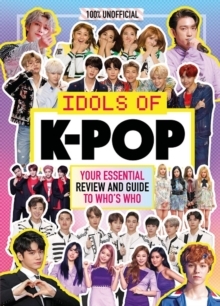 Whether you're new to K-Pop or a die-hard super stan, 100% Unofficial Idols of K-Pop is your essential guide to the current K-Pop scene - packed with profiles, pictures, facts, stats and gossip. Meet the idols breaking the internet and pushing fashion boundaries, learn the language and go heart-eyes emoji over the cutest ageyo moments from your fave maknae. K-Pop is a multi-billion dollar industry and the Korean Wave has never been bigger. Korean bands are breaking YouTube records, selling out the O2 and basically winning social media. Bands with huge followings like BTS, BLACKPINK, EXO and TWICE are making waves across the globe and then there's BIG BANG, NCT, Red Velvet, and WANNA ONE following close behind. Whatever your bias, you need this book.